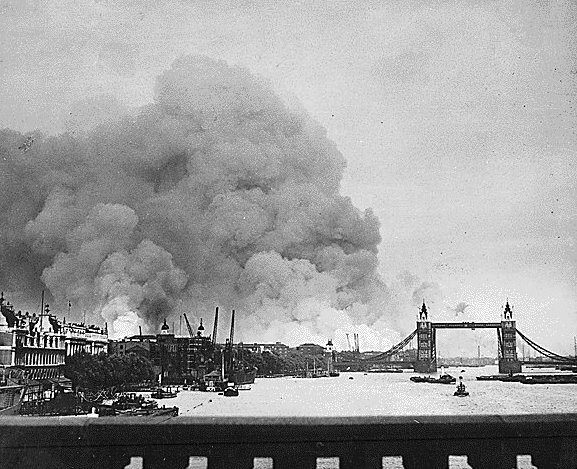 If the V&A’s latest exhibition demonstrates that big can be beautiful, the new acquisition at the Imperial War Museum shows that small can be profound. It’s a car, badly damaged and barely recognisable, that was caught in a suicide bomb blast in Baghdad in 2007. The artist Jeremy Deller got hold of it and toured it across America on the back of a truck in the company of a US soldier and an Iraqi citizen for a piece entitled It Is What It Is. Now, shorn of any artistic element, it is on display at the Imperial War Museum. My review in the New Statesman can be read here. After interviewing Deller, I avoided reading too much about the car before I wrote the piece other than this by Jonathan Jones in the Guardian. Jones, I think, slightly overdoes his praise – is it really true that ‘a dismembered body is what you immediately think of when you come into the museum and see a car’? – while the commentators beneath the line seem obessessed with the pointless and hoary argument about ‘what is art’. They’ll never be able to answer that question from behind their computer screens because this compelling and thought-provoking piece needs to be seen on location and in context to be fully appreciated. It’s a fine and valuable addition to the IWM’s collection and makes a fascinating footnote in the history of war art. Oh, and Jeremy Deller is one of the nicest famous people I have ever interviewed, right up there with Graham Taylor, the former England manager, belittled turnip and little appreciated ballet enthusiast. The Story of London festival was introduced by Boris Johnson last year and immediately came under a lot of fire. 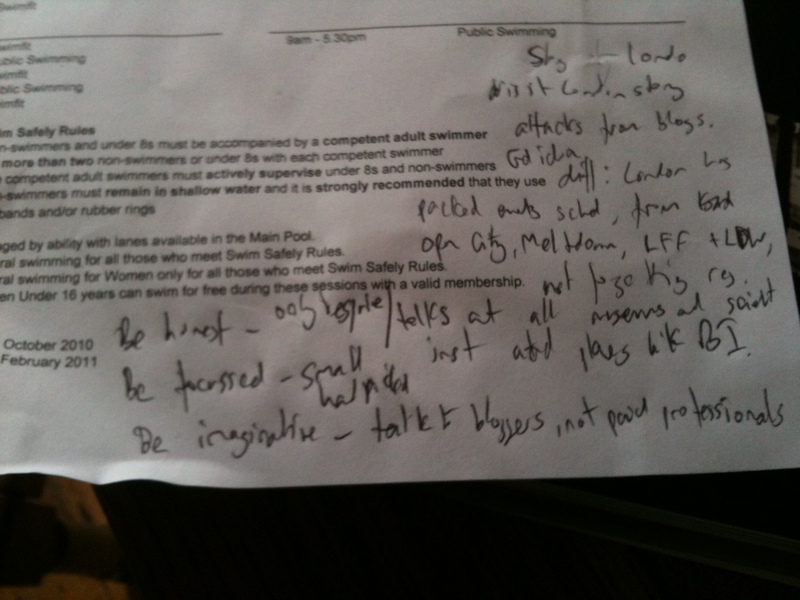 Here’s something from Boris Watch plus stern words from Diamond Geezer. The festival is not a bad idea. It’s intended to cover the history of London in a way that includes all boroughs, all ages, all races and all genders – a riposte to Ken Livingstone’s habit of staging festivals for different minority groups at a Balkanised Trafalgar Square. Part of the problem is publicity, and this is of the mayor’s own doing. In 2009, there was little or no attempt to promote the nascent festival by the city’s tourist office because their funding had just been slashed by Boris and they pretty much refused to help. The organisers then had to take their minute budget to Time Out, where I ended up knocking up a few pages to pull out of the middle of the mag that due to a hilarious production error did not actually pull out. It was nothing like the sort of lavish inserts the company can produce when given some cash and time. The other problem is that London already has loads of festivals – Open House, Meltdown, the London Film Festival, London Design Festival, the City of London Festival and dozens more – while institutions such as the Bishopsgate Institute regularly put on fantastic cultural events. And that’s before we even bring in the other museums, universities, galleries and scientific institutions. 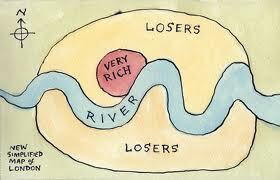 The Story of London simply does not have a distinct identity to compete with these established players. With barely a niche to be found in London’s crowded cultural calender, Story of London has taken to hijacking and rebranding existing events, which doesn’t impress anybody. And they are so busy doing this they forget to organise any showpiece events that would help to give the festival a character of its own. Plus, they don’t have any money. The result is a bit of a mess. So what could they do? Fortunately for them, I was able to scribble a few suggestions on the back of a press release in between playing Secret of Monkey Island on my phone and wondering why I’ve rarely heard of a single person who appears in the Standard’s Londoner’s Diary. Be honest – don’t hijack events that have nothing to do with you as it just looks cheap. And if you insist on this policy, it means that desperate organisers of terrible events will attempt to smuggle their substandard fare into your festival and you’ll have no way of keeping them out. Bespoke – ensure that anything carrying the Story of London banner is new and brilliant and has genuinely been arranged specifically for the festival. That makes it fresh and makes it exciting and should ensure that you can keep an eye on the quality control. Be focused – find a theme and stick to it. Make it broad and make sure that every borough has at least one institution participating. Narrow the time frame so it all takes place on a single weekend. Keep it tight at first and let it grow organically. At the moment it is a big blancmange of a festival when it should be as tight and pretty as an avocado stone. Be clever – one of the best festivals the mayor currently has at his disposable is the Thames Festival, so hook the whole thing round that. A wee bit of rebranding – and yes, this is hijacking, but it’s hijacking with a point – and you have a ready-made spectacular way to close the weekend with the annual fireworks display. Be imaginative – the guys from the Londonist website are already involved in one small event, but why not ask them to think up something big and crazy? These – and other – bloggers live and breath London in a way few paid professionals can compete with, so talk to them. They may not be interested, they may have terrible ideas, they may have no ideas, but they may just come up with a couple of events that curators and pros can turn into something special. Because at the moment, as Ian Visits says, the Story of London is just ‘a way for a lot of venues who are already planning to do something to get involved in a joint media campaign’. And that’s as far as I got. LeChuck was causing all sorts of problems and I had to Google Laura Weinstock. But hey, it’s a start. The story goes like this. In 1955, Chelsea were chasing an unexpected league title when they lost a crucial home game, 6-5 to Manchester United. Manager Ted Drake, devastated at a result that could have cost Chelsea their first trophy never mind championship, took a phone call later that evening from the club’s chief scout. He expected the scout to be equally disappointed about the result, but instead the man on the other end of the phone was elated. That afternoon he had discovered Chelsea’s future, the best player the club would ever produce: Jimmy Greaves. There was a similar feeling at Stamford Bridge on Wednesday evening, where Chelsea fans emerged from the ground in extraordinarily good spirits despite witnessing a 4-3 defeat to Newcastle United. A 17-year-old called Josh McEachran, who came on when Chelsea were 3-1 down with 30 minutes remaining and went to give a display of such confidence and string-pulling panache that some older fans were saying it was the best debut from a youth player since Osgood’s, while others were comparing him with Cruyff and Xavi. Well, perhaps. It’s important not to get too carried away. Recent Twitter antihero Leon Knight was described as the ‘new Zola’ in the 1990s and he’s now agitating for a move to Rushden & Diamonds. But when you see a performance of this maturity from a 17-year-old making his home debut for a team that is 3-1 down and playing with ten men, well, you are entitled to dream, aren’t you? 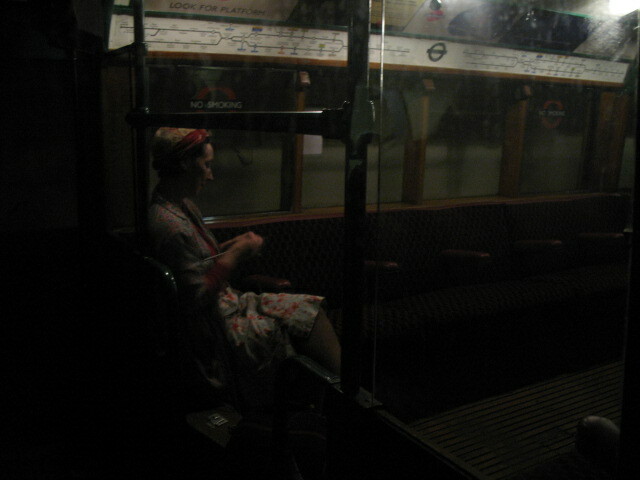 Transport for London allowed Aldwych station one of its periodic reopenings this weekend, with 1940-themed tours of the station and platform to commemorate the 70th anniversary of the Blitz. 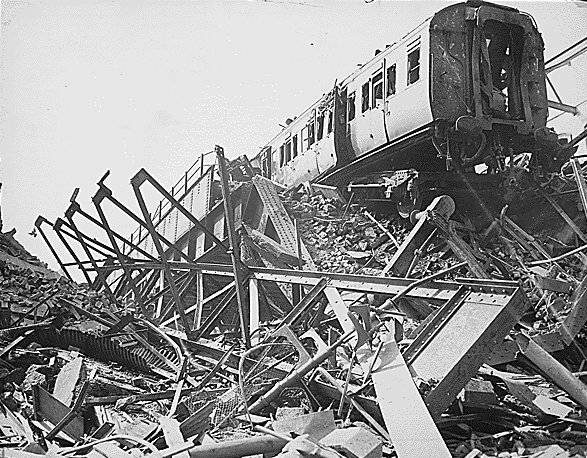 The tours – which are completely sold out so don’t even try – were arranged to complement the Under Attack exhibition at the London Transport Museum, as explained by museum director Sam Mullins in this BBC clip. As a part-time moleman who has never been inside Aldwych, I was down there like a greedy ferret in a goldmine. 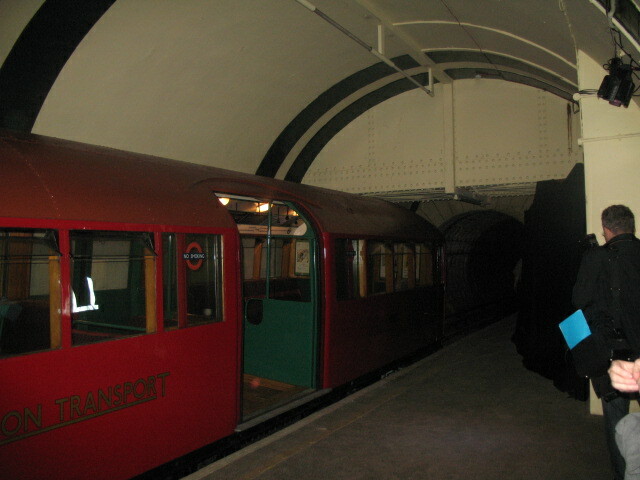 Aldwych, a pointless spur on the Piccadilly Line, closed in 1994 and its history can be read at the wonderful Subterranea Britannica or Abandoned Stations. Ian Visits and Diamond Geezer also have posts about the station. I’ve wanted to get inside it for ever such a time. 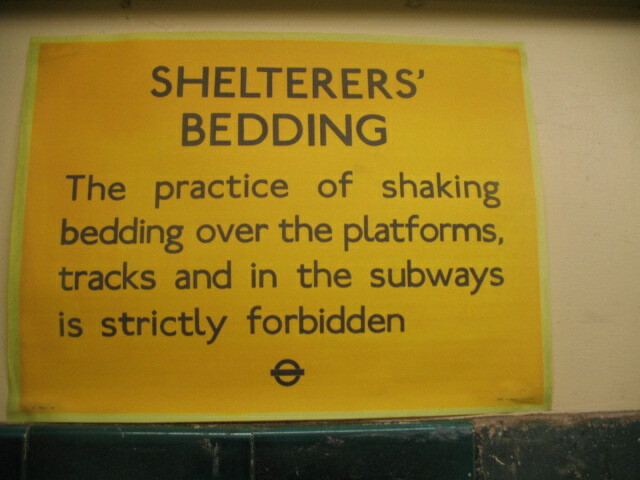 The tours begin in the neat but spartan ticket office, which is decorated with a number of wartime posters giving instruction about shelters and the blackout. You are greeted by an actor playing an Air Raid Precautions officer, whose monologue is interrupted by the forbidding wail of an air raid shelter. You meet three more such actors in the course of the tour, the best being the 1940s housewife who sits in the train down on the platform and can be quite saucy if you ask the right sort of questions. The chance to poke around the station and listen to actors recreating 1940s stereotypes is all well and good, but the star of the show is undoubtedly the 1938 train that has been brought out of retirement for the occasion. I’m no train nerd, but this one is a beauty, as I’m sure better photographers than I will record this weekend. The other highlight is this cracking little souvenir book about Aldwych and the Blitz that is given to everybody who goes on the tour. The tour ends with a deafening reconstruction of an aerial bombardment, with impressive sound and light, before the all-clear sounds and allows you to climb the steps back to the surface (no lifts or escalators, so prepare for a walk). A recreation of the ‘Blitz experience’ is an almost impossible thing to pull off for obvious reason and this is neatly done in the circumstances, although it might have been nice to have bunks on the platform to give more of a flavour of what it was like to cower down there for a night. 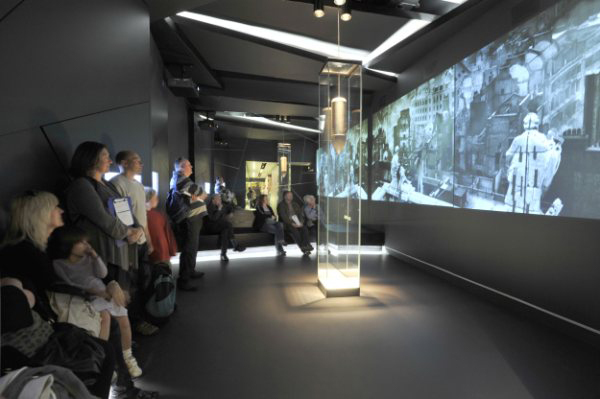 Interest in the tours have been so great – an estimated 3,000 people will take part this weekend – that the London Transport Museum believe public tours of Aldwych will be reintroduced on an irregular basis in the future. So that’s one ambition sated, only for another to take its place. 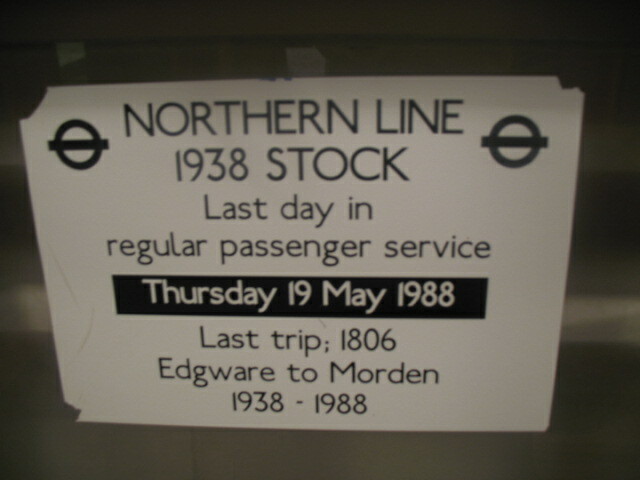 Earlier this week I was talking to a curator at the LTM, who told me of his recent tour round Down Street, another abandoned station with wartime connections. It is, he told me, in ‘fabulous condition’. Anybody interested? 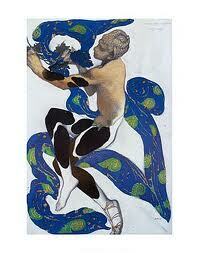 Two months ago I knew diddly about Diaghilev. Since then I’ve written two features about him – including this in the Independent On Sunday – and can confidently assert that this Russian-born impressario changed the face of ballet in the early twentieth century when his company, the Ballets Russes, enlisted artists and composers like Picasso, Matisse and Stravinsky to showcase the work of groundbreaking dancers and choreographers like Nijinsky and Massine. Such is the magic of journalism. The occasion is the V&A’s big autumn exhibition, Diaghilev and the Golden Age of the Ballets Russe, which opens on September 25. It’s an incredibly rich exhibition, crammed with memorabilia and costumes and images and music. Highlights include the astonishing, undanceable costumes from Parade, Picasso and Cocteau’s ‘Cubist ballet’, the monumental back cloth from ‘The Firebird’, and a wonderful bust of Nijinsky that captures his odd features. I’m not a great fan of the ‘blockbuster’ exhibition as they are rarely as satisfying and intelligent as intimate displays at the more thoughtful museums, but this one is a real cracker, demonstrating decades of learning and showcasing a marvellous collection of costumes bought in auction and secured in the V&A’s vaults for just such an occasion. 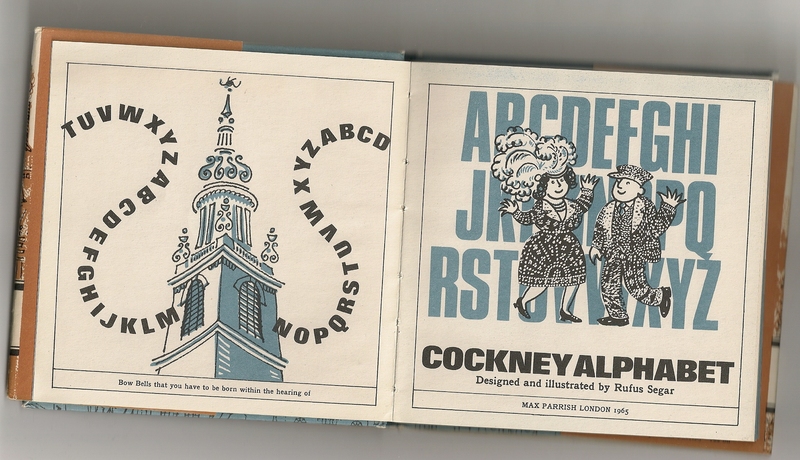 The Cockney Alphabet is a humorous alphabet originally devised by music hall duo Clapham & Dwyer in 1929 that rewrites the alphabet with cockney phonetics, starting with A for ‘Orses (Hay for Horses) and ending with Z for Effect (Said for Effect). There are loads of different versions and this wonderfully illustrated little toilet book from the 1960s has a nice potted history of the form, including a list of four of the most popular alternative versions. 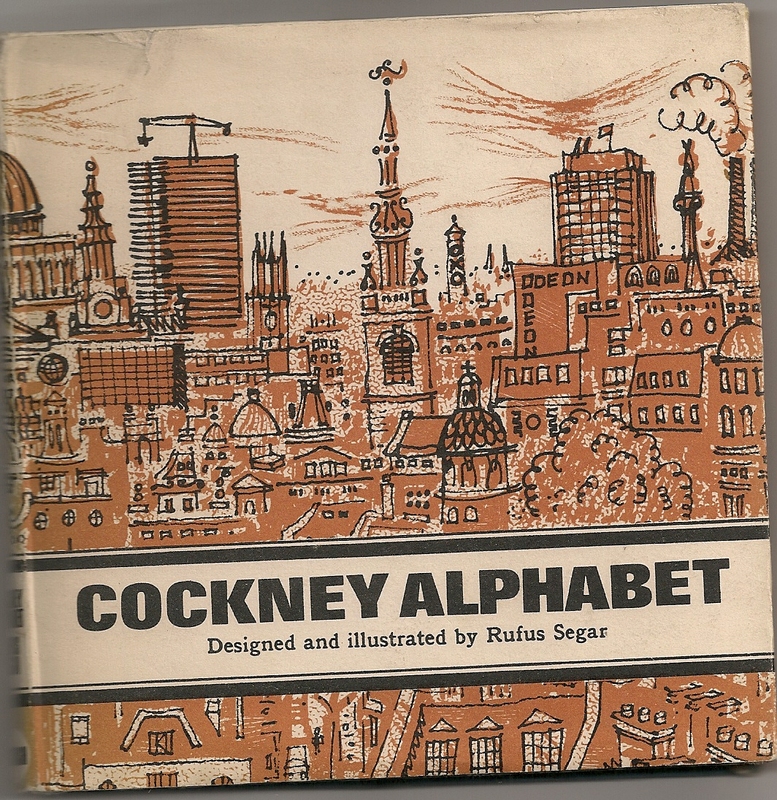 Like rhyming slang, the alphabet can be rewritten to take in topical themes or personalities (this book has U for Fox, or Uffa Fox, a now forgotten British sailor; it also has Q for Beatles over the traditional Q for the Dole). Some of the contributions can be hard to comprehend (D for Payment?) but Segar insists that ‘with perseverance and some latitude in pronunciation they will suddenly become meaningful’ (ah, ‘Defer payment’!). And we can’t ask for more than that. 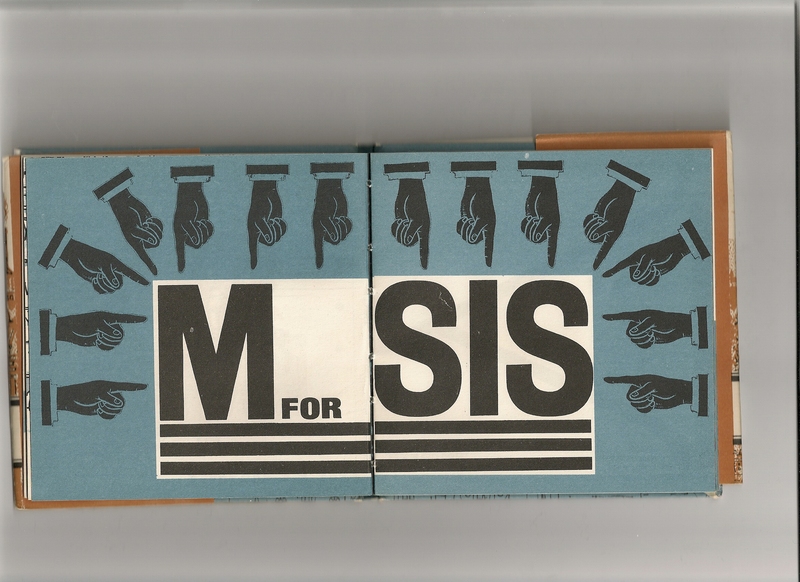 Best bit Illustratively: ‘G for Police’; phonetically, ‘M for Sis’. Verdict Time for an update? Jason Cobb, one of south London’s finest bloggers and a hyperlocal hero, is leaving London, defeated by the relentless pace of life in the city and fearful of ‘becoming what I despise – a right wing bigot’. Just about the only people who will be relieved by his departure will be Lambeth Council, who have regularly been held to rigorous scrutiny by his wonderful Stockwell-based Onion Bag Blog. Jason was also tremendously helpful and encouraging when I decided to set up my own blog, for which I am forever grateful. Wivenhoe doesn’t know what’s about to hit it. Title London’s Bridges by Peter Matthews (2008, Shire). I bet the publisher loved reading that. It’s a lovely book though, wordy but not too long, nicely illustrated and ruthlessly factual. Bonus points for including non-road bridges such as Grosvenor Railway Bridge. There’s some great trivia to be found: ‘In 1873, the Royal Humane Society set up a 24-hour ‘receiving host’ by the northern end of Waterloo Bridge, manned by a doctor who would attempt to revive any suicide victims brought to him, and in 1875 alone 21 people were saved by this method’. The author, Peter Matthews is a proper London nerd and runs the bookshop at the Museum of London, so you can be fairly sure you’ll be able to pick up a copy there.